Defending the IPCC consensus regarding natural-versus-anthropogenic climate change is Gerald R. North, Distinguished Professor of the Physical Section, Department of Atmospheric Sciences and the Department of Oceanography at Texas A&M University. Richard S. Lindzen, the Alfred P. Sloan Professor of Meteorology at the Massachusetts of Technology, will challenge the IPCC consensus, arguing that real-world climate sensitivity lies below the iconic range of 2c–4.5C. Questions about ‘Climategate’ and the newly emerged ‘Himalayangate’ (the latter exposed by Dr. North’s Texas A&M colleague, John Nielsen-Gammon) are expected to be covered in the question/answer period after the scientists’ formal 30-minute presentations. [DIRECTIONS McMurtry Auditorium is located in Duncan Hall. Visitor parking is available to anyone with a credit card. Visitor Parking “L” and Founder’s Court Visitor are the closest to Duncan Hall, in particular using the Rice main entrance on South Main Street at Sunset Blvd. Another parking lot is the North Lot, 5-8 min walk to Duncan Hall, on Rice blvd using entrance # 21 or 20. Having this climate debate is very good news. 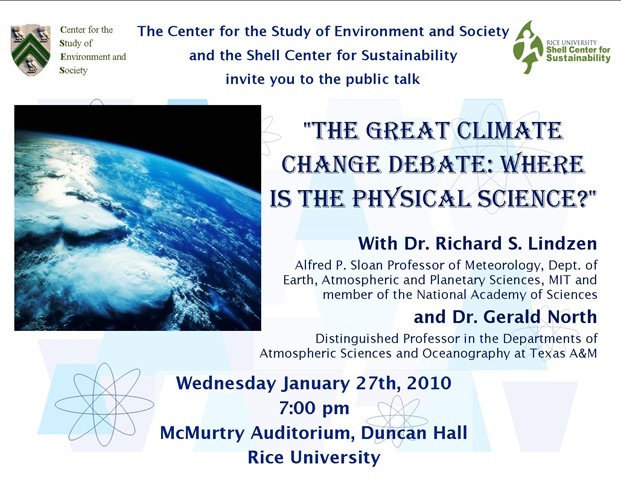 The last climate science debate at Rice University was in the summer of 2000 at the James A. Baker Institute. Therein lies a story…. I attended this well-attended conference. It was fair and balanced in its different dimensions with ‘skeptics’ of climate alarmism present such as Pat Michaels on the physical science; MasterResource’s own Ken Green on public policy; and Senator Chuck Hagel (R-Nebraska) on politics. What I remember most is talking to James Hansen and his remarking that anthropogenic global warming could save us from a new ice age. In his own eyes, he was making an ironic point about high climate sensitivity; to me, he was making the point that extreme scenarios can work in both directions–good and bad. A summary of the conference carefully balanced out the alarmist and skeptical views of the issues. I reproduce it in Appendix A below because of its historical significance given where the science, economics, and policy issues are nearly ten years later. The faculty organizers of the climate conference readied the proceedings for publication. However, release was blocked by a former faculty member who spoke at the event and returned to campus from the Clinton Administration. The same issue of the The Baker Report (p. 5) provided the background to this unexpected development. Neal Lane, assistant to the president of the United States for science and technology, director of the U.S. Office of Science and Technology Policy, and former director of the National Science Foundation, has rejoined the faculty at Rice University. Lane, 62, returned to Rice from the Clinton White House to take the position of University Professor in the Department of Physics and Astronomy and senior fellow at the James A. Baker III Institute for Public Policy. University Professor is a special appointment entitling the holder to teach in any department in the university. Lane is the only person ever to hold the position at Rice. “This is another signal day for Rice University, as we welcome back our colleague and faculty member Neal Lane, who has served his country with such distinction in several vital national positions,” Rice president Malcolm Gillis said. “Neal Lane will make a significant contribution to the Baker Institute’s future research and programs on science, technology and engineering issues,” said Director Edward Djerejian. “He will, in effect, be a natural bridge between the Baker Institute and The Wiess School of Natural Sciences and The George R. Brown School of Engineering…. In his most recent role, Lane provided the president with advice in all areas of science and technology policy, and he coordinated policy and programs across the federal government. He also cochaired the president’s Committee of Advisers on Science and Technology Policy and managed the president’s National Science and Technology Council…. From this time until today, Dr. Lane has shut down debate on the physical science of climate change, as well as any participation in Baker Institute conferences of skeptics of climate alarmism. Baker conferences on energy and climate have featured the controversial John Holdren, the subject of a series of MasterResource posts, but no champion of the view that CO2 is a social good on net and/or government mitigation of CO2 emissions beyond natural free-market forces is unmerited under realistic economic and political scenarios. Dr. Lane also blocked a scheduled talk by Bjørn Lomborg at the Baker Institute in 2004. Instead, Lomborg was allowed to speak at the business school before an enthusiastic crowd of 200. Dr. Lane was following the Holdren line that Lomborg was an anti-science propagandist, a view that I have rebutted in a 2003 piece, The Heated Energy Debate. History may harshly judge Neal Lane’s academic censorship; after all, a fair debate on a VERY contentious issue has been precluded for many years for students and members of the public who trust the Baker Institute. And the question must be asked: would James A. Baker himself approve of this bias coming from one gatekeeper? A New Beginning for Lane/the Baker Institute? Perhaps, just perhaps, the new scientific and political climate will inspire the Baker Institute to join the other campus groups Shell Center for Sustainability and the Center for the Study of Environment and Society in open, two-sided debate. I hope this Wednesday night’s discussion will be well attended and will inspire a new beginning in this regard. Conference coordinators were Peter Hartley, chairman of economics; Andre Droxler, associate professor of geology and geophysics; and Kenneth Medlock, Baker Institute Scholar. do the GCMs need to be modified to explain real differences? and how can they be included better in climate models? • What is the role of the sun in the earth’s climate? • What does the geological record tell us about global warming? rapid (a decade or less) changes in climate? might the warning signs be? The scientific, economic, and political issues surrounding global warming were debated extensively a a Baker Institute conference September 6–8, 2000. Titled “Global Warming: Science and Policy,” the conference featured experts from diverse fields, such as atmospheric physics, astronomy, biology, economics, geology, oceanography, and politics, who offered their perspectives on this contentious scientific and political issue. A central question of the conference was to what extent human activity affects climates at the global level. The costs and benefits of possible climate change were discussed, along with the geographic distribution of those effects. The feasibility and costs of mitigating human influences on the global climate also were considered. increased exponentially. The degree to which humans rely on fossil fuels is indicated by the fact that in 1997 fossil fuels provided about 86 percent of primary energy requirements globally. As a result, since 1958 the concentration of CO2 in the atmosphere has risen about 14 percent and is now about 30 percent above pre-industrial levels. Furthermore, the Intergovernmental Panel on Climate Change (IPCC) currently estimates that CO2 concentrations will rise during the next century to a level 90 percent above pre-industrial levels. correlation, since about 1970, between the rising atmospheric concentration of CO2 and rising average temperatures has led [to the] … hypothesis, referred to as the “greenhouse effect,” [in that] CO2 and other greenhouse gases absorb some of the infrared radiation that is emitted from the earth’s surface after the sun warms it. This, in turn, warms the atmosphere, thereby increasing the amount of water vapor. Increased water vapor then can amplify the effect of CO2 to produce noticeable temperature increases. The fact that most warming is caused by higher humidity explains why the largest predicted temperature increases are at night in the cold winter air masses found in the polar regions. Since the coldest air masses are also the driest, they experience the largest percentage increases in humidity. In contrast, increased humidity at tropical and temperate latitudes produces an increase in cloud cover, which tends to cool the atmosphere by reflecting incoming solar radiation. At temperate latitudes, higher humidity increases winter snowfall, which again reduces the absorption of incoming solar radiation. on the climate. For example, ozone depletion and changes in stratospheric winds were pointed to as having significant effects on climate. Another complication is that increased CO2 can stimulate plant growth and, more generally, biosphere productivity. Since carbon compounds form a large part of living organisms, an expansion of the biosphere would tend to reduce CO2 concentrations in the atmosphere. The existence of these types of competing factors makes the likely consequences of increased greenhouse gas concentrations difficult to predict. The only feasible way of making such predictions is to build complicated global computer models (the GCMs) that simulate the interactions among the various processes. There is general agreement that the earth’s surface has been warming in recent decades, but uncertainty remains as to how much warming has resulted from increased CO2 and how much warming has resulted from other forcing phenomena. For example, it was argued that variation in solar activity could explain much of what has been observed in the surface temperature record. In addition, it was argued that control of greenhouse gases that are more potent than CO2 could be the most effective and easily implemented means of combating global warming. of the projections (a 75 percent drop in seven years, and almost 40 percent in five) is an indication of the uncertainty of climate science. In fact, it was recognized throughout the conference that today’s GCMs are inadequate, as indicated by the wide variability in the predictions of different models. However, it was argued that there is something to be learned by the fact that all of the GCMs are broadly consistent in predicting a warming trend. the change could occur abruptly. Initially, warming may cause a gradual melting of ice, but if large chunks of land-based ice fall into the ocean, they will melt more rapidly. Apart from the impact this would have on sea levels, the resulting influx of fresh water into the oceans could affect the circulation of ocean currents, producing further changes in climates. There is geological evidence that suggests the world’s climate can switch rapidly from one stable state to another. Damage is likely to be greater when changes occur abruptly. The amount of CO2 that must accumulate before a catastrophic event would occur, however, is unknown. The timing and severity of any potential damage, therefore, are also difficult to predict. Despite the uncertainties surrounding the causes and ramifications of global warming, governments are being urged to act. An international agreement, known as the Kyoto Protocol and as of yet to be ratified by any of its signatories, calling for the reduction of greenhouse gas emissions was signed in 1997. The Kyoto Protocol specifies a greenhouse gas emissions target of between 5 percent and 8 percent below 1990 levels by 2008–2012 for a group of industrialized nations (referred to as Annex I countries). Carbon taxes or direct controls could be used to achieve these targets, but they are likely to be very costly. Costs also will be higher the faster controls are enforced since reducing emissions in the short term generally requires reducing production, causing some degree of capital obsolescence. Relatively low-cost methods of control, such as land use changes, the clean-development mechanism (CDM), and emissions permit trading, have been proposed, but methods of implementation have yet to be worked out. The methods of control and the speed of enforcement will determine the magnitude of the costs of compliance. Countries also may incur lower costs if weak enforcement allows controls to be evaded. Modeling the economic cost of taking CO2 abatement measures is just as difficult as modeling the climate. Uncertainty pervades the exercise, due to a number of problems. The lack of clearly defined guidelines for reducing CO2 emissions, an inadequate understanding of the potential of new technologies, and more conventional problems of projecting economic growth, the composition of fossil fuel use, and projecting energy prices each contributes to this uncertainty. Therefore, while we cannot be certain whether or not global warming is an immediate and serious threat, we also cannot be certain about the economic costs of taking steps to eliminate an uncertain threat. A potential solution to the global warming problem lies in the wake of the development and implementation of new technologies. Energy sources such as solar power, fuel cells, hybrid technologies, and so forth could greatly increase efficiency of fossil fuel use or could eliminate it altogether. Computer technologies also have the potential to increase energy efficiency by more adequately regulating manufacturing facilities and the like. This could considerably reduce CO2 emissions without imposing high economic cost. However, the time horizon for cost competitive implementation is uncertain, and, if too far into the future, damages from global warming could be high. In addition to the panel of experts in their respective fields at the conference, four keynote speakers addressed the participants and attendees, each presenting his own perspective on the issues at hand. Neal Lane, assistant to the U.S. president for science and technology and director of the Office of Science and Technology Policy, addressed the difficulties with reconciling science and policy. He noted that science must advance in understanding how climate has changed in the past and how it will change in the future so that an accurate assessment of human activity can be made. He recognized the large amount of uncertainty in predicting future climates but presented evidence of the correlation between global temperature and atmospheric CO2 levels. Lane also presented possible climate-change impacts on different regions of the U.S., as predicted by different GCMs, that are, as he argued, aimed at raising the awareness of groups and individuals. He also stressed the global nature of climate change and argued that the largest impact on the U.S. could come from climate-related disruptions in other parts of the world. Finally, Lane recognized that policy will move forward, as it operates on a different time frame than does science. So, the best possible science needs to be communicated to policymakers as it becomes available. Richard Burt, former ambassador to the Federal Republic of Germany and assistant secretary of State for Europe, addressed issues of international sovereignty. Recognizing that a global agreement to abate CO2 emissions will require the formation of an international regulatory body, he questioned if governments should cede power to a new system of global governance. He argued that a United Nations-type body would be inefficient and, perhaps more important, would hold no democratic accountability. Thus, Burt claimed, any such body that attempted to wield power would be rejected, particularly in the U.S., because it is anti-democratic in nature. A more suitable model, he added, would be one in which control and enforcement was instituted at a national level so that sovereignty is not infringed. U.S. Senator Charles Hagel (Nebraska) argued for a new approach to the issue of climate change. Citing the ongoing debates within the scientific community and the lack of a definitive consensus prediction of climate change, he claimed that radical and swift action to abate CO2, such as that called for in the Kyoto Protocol, is unnecessary. Hagel also added that such action could cause detriment to the U.S. economy that outweighs any benefit. He argued instead for a cautious approach that would allow for the advancement of climate science while preserving economic well-being. formed. He recognized, as Lane did, that policy will move forward regardless of the state of science; thus, accurate and sound science is all the more necessary. Although a clear policy agenda did not emerge from the conference, substantial agreement was reached on several points. Better measures of temperatures at ground level are a top policy priority and could be attained relatively cheaply. thoroughly the predictions of computer models of the earth’s atmosphere. The TAO/TRITON program to monitor El Niño in the equatorial Pacific Ocean provides a model for such a global climate monitoring system. There are a number of questions regarding the science of global climate change that need further investigation. Current GCMs do not account for all of the mechanisms that affect climate. Better models will require improved understanding of the various interactions within the climate system…. Economic models of the cost of reducing emissions were criticized for their limited predictive accuracy, as were the climate models. There was general agreement, however, that the more flexible the control mechanism, and the more gradually it is introduced, the lower the costs will be. There also was agreement that the high costs of reducing fossil fuel use and uncertainty about the science of global warming imply that we ought to be cautious about implementing emission controls. The conference on global warming was sponsored by Carolina Power and Light Service Co., ExxonMobil Corp., and Southern Company Services Inc.
Any chance they will make videos of the talks, or powerpoints, available? Here is some local media coverage. I found it a little jerky but I think that’s my computer. le facon para voir votre jeux ainsi que de l’apprecier.